EmTherm CR, is a Corona Resistant enamelled copper wire, belonging in C (220°C) thermal class, able to be manufactured in the diameter range of 0.50 – 2.20 mm with three different insulation layers. Providing thermal resistance up to 220°C, EmTherm-CR possess the feature of being winded at high speeds and is resistant against corona effect. Produced specially for inverter driven motors, it has a life time up to 10 times longer. EmTherm-CR is enameled copper wire which is at HC class (220°C) thermal class, polyesterimide coating, producing 0.50 between 4.00 mm diameter and it can be colored with Corona preferably. 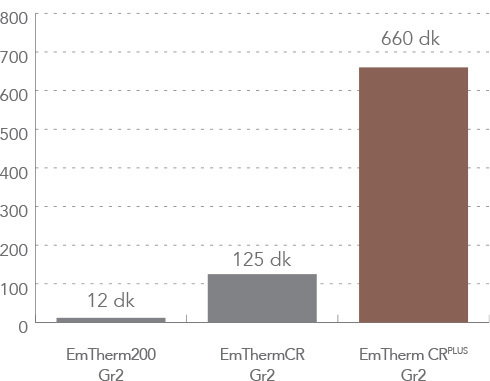 EmtTherm-CR is resistive up to 220°C, clings at high speed and enduring to Corona effect. It is long-lasting 10 times for inverter motors specially. Manufacturer: Emtel Enamel Wire and Cable Industry Co.